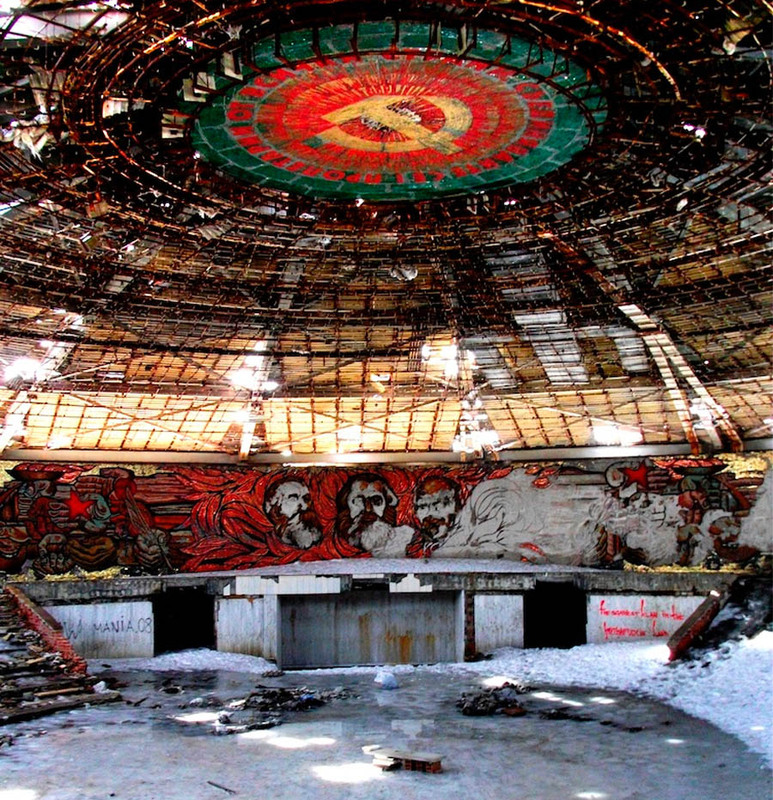 One site which definitely warrants inclusion into our Abandoned Places list is the otherworldly Communist Party Headquarters on Mount Buzludzha, Bulgaria. 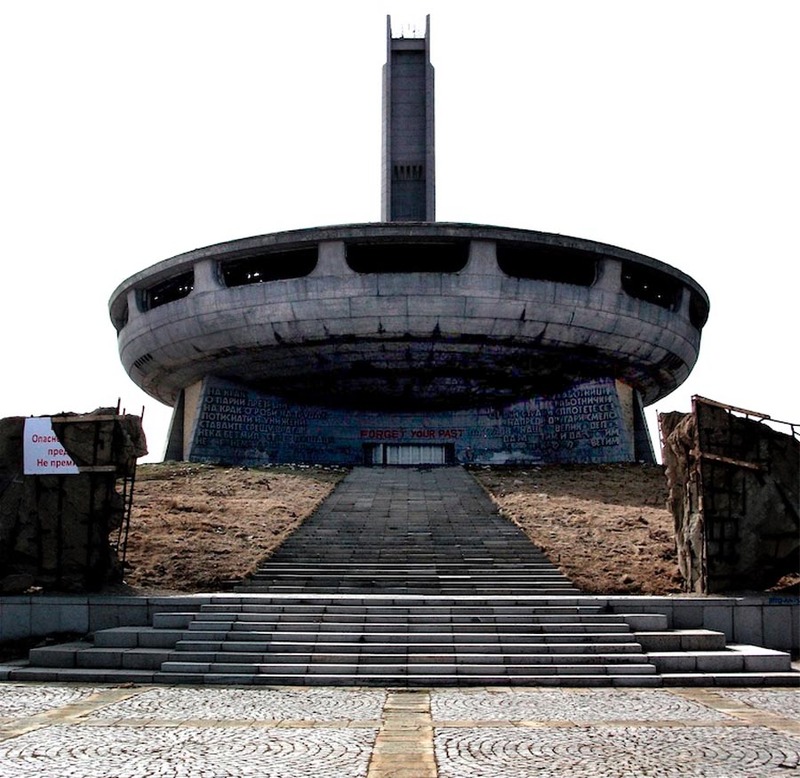 The Buzludzha monument – or to give the building its official name, the ‘House-Monument of the Bulgarian Communist Party’ – was envisaged as a symbolic meeting place for the communist regime. Resembling something straight out of a 1950s sci-fi flick, the colossal concrete saucer perches at an altitude of 1441 metres above sea level – on one of the most inhospitable peaks of the Balkan Mountains. It was here that foreign dignitaries would meet with local communist leaders, beneath the tiled mosaic faces of Engels, Marx and Lenin. 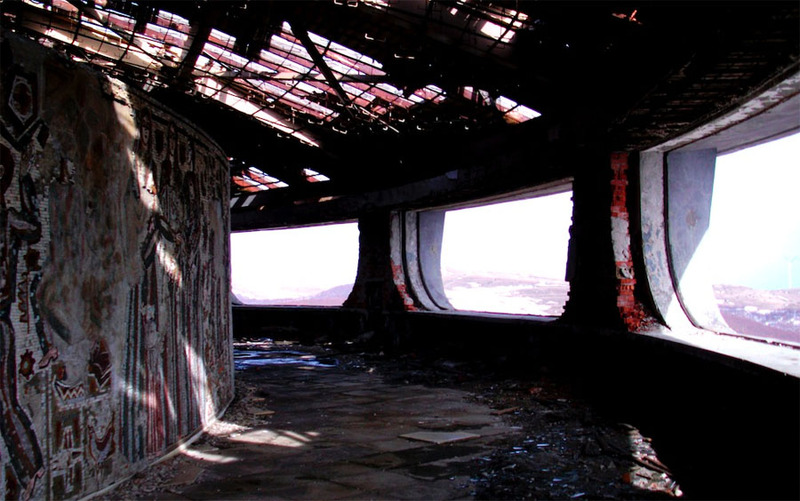 During its heyday Buzludzha was a centre for political rallies and award ceremonies, set in a remote location linked to one of the great turning points in Bulgarian history; just 18km from the peak of Mount Buzludzha, the Shipka Pass saw perhaps the bloodiest battle of the Russo-Turkish War. An iconic symbol, intended to mark Bulgaria out amongst the rest of the communist world... The House-Monument of the Bulgarian Communist Party was completed in 1981, for the 90th anniversary of the Battle of Shipka Pass. The project cost in excess of 16 million Bulgarian Levs – that’s something in the region of 10 million US dollars, before you take inflation into account. “ON YOUR FEET, DESPISED COMRADES! The words come from ‘The Internationale’: a revolutionary song from the nineteenth century, which gained great popularity amongst socialist, communist and leftist groups. Here though, the verses have been recorded in an old dialect of Bulgarian. As such, it seems to summon up a sense of the nation’s proud and independent past. The House-Monument of the Bulgarian Communist Party was no doubt a wonder in its day. Bulgaria’s socialist republic came to an end in 1990 however, just shortly before the final collapse of the USSR in 1991. After this point, the decay set in fast. Bulgaria is one of the newest countries to join the European Union; this sparsely populated nation being perhaps best known for its Black Sea beaches, strong liquor and rose fields. 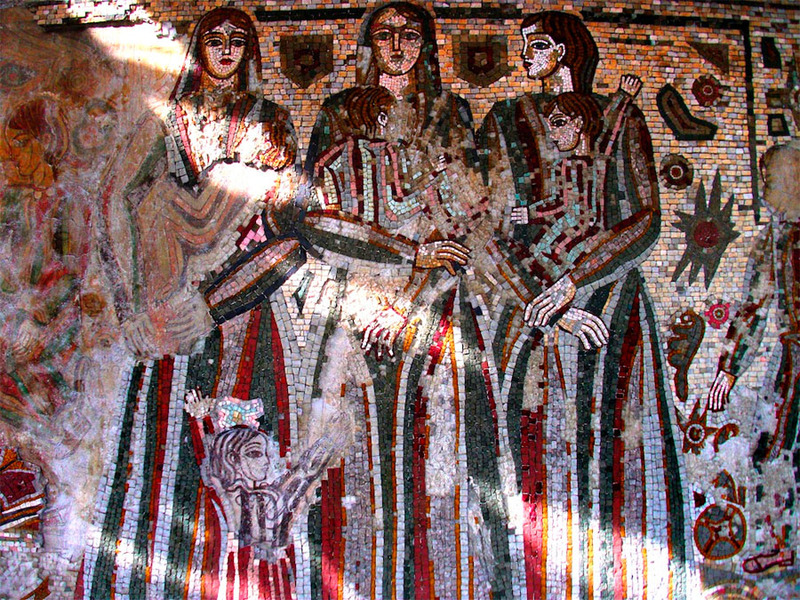 However, for some visitors Bulgaria also offers a unique window onto a time gone by. Bulgaria had been under Ottoman occupation for almost five centuries, and following the liberation of Bucharest to the north, an army of Russian and Romanian forces swept down into the country’s northern plains. Bulgaria is divided in two, from west to east, by the Balkan Mountains. In 1877, a troop of 2,500 Russian soldiers and roughly 5,000 Bulgarian volunteers stormed a Turkish garrison at Shipka Pass… before successfully holding it against a 38,000-strong Ottoman army approaching from the south. It was the beginning of Bulgaria’s long-lasting fealty towards her Russian cousins. Bulgaria reclaimed its independence in 1891, reverting to the Tsardom it recognized prior to the Ottoman invasion. 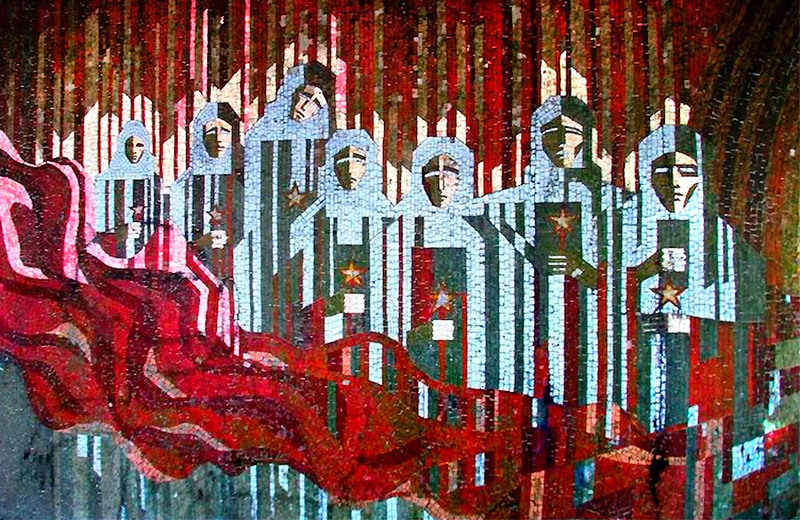 However, socialist revolutionaries began meeting in secret on Mount Buzludzha. Following in the footsteps of post-revolutionary France, Dimitar Blagoev and other social philosophers began laying the foundations for the Bulgarian Social-Democratic Workers' Party… a precursor to the later Bulgarian Communist Party. Bulgaria was locked in the thrall of communism from 1946 until 1990, during which time orders came from Moscow and many school children began each day with a recital of the Russian anthem. This era also saw the construction of a number of vast, concrete monoliths, as the new regime sought to plant its stamp onto the very fabric of the land. 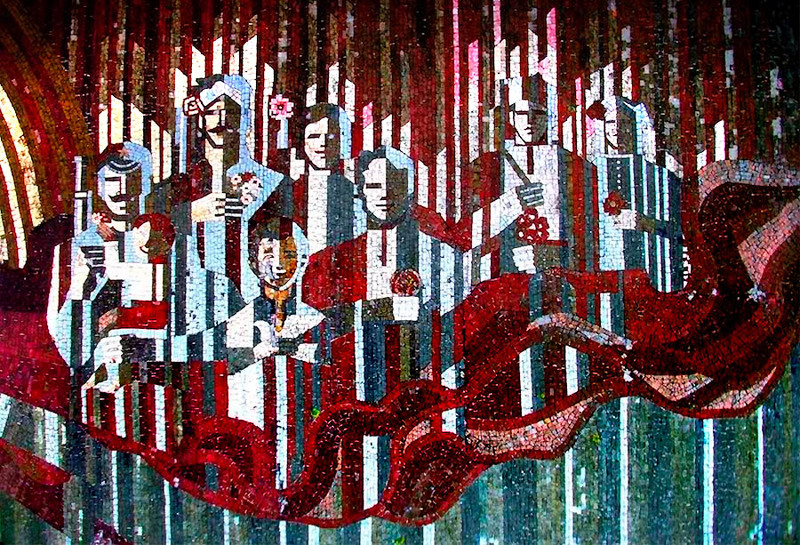 More than 150 communist monuments appeared across Bulgaria during these years, overlooking mountain lakes, or rising in the hearts of cities; they stand in forests and in cemeteries, in parks or by the coast. Rich in symbolism, these structures are designed to represent ancient heroes, or to glorify the icons of Soviet ideology… one feature they all seem to share however, is their stark, brutalist style. 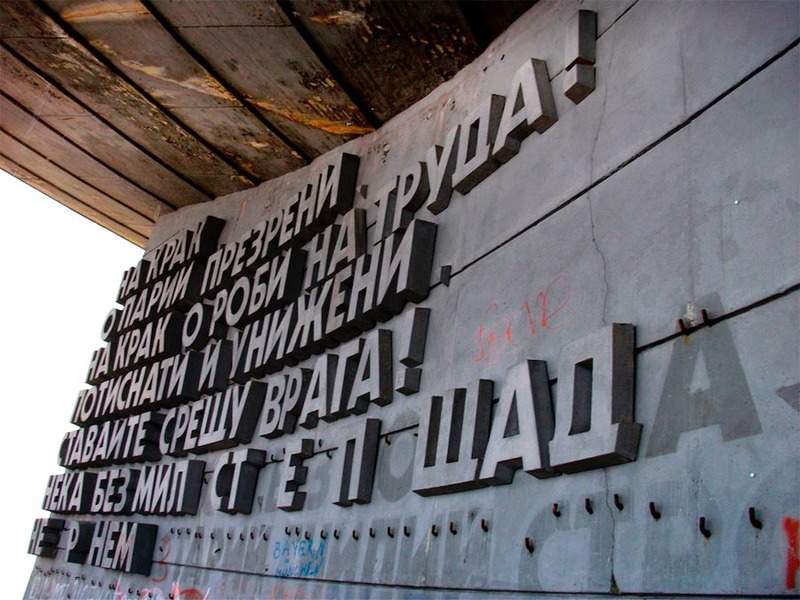 Sometime after 1991, the words ‘FORGET YOUR PAST’ were scrawled in red paint above the main entrance to the Buzludzha monument. 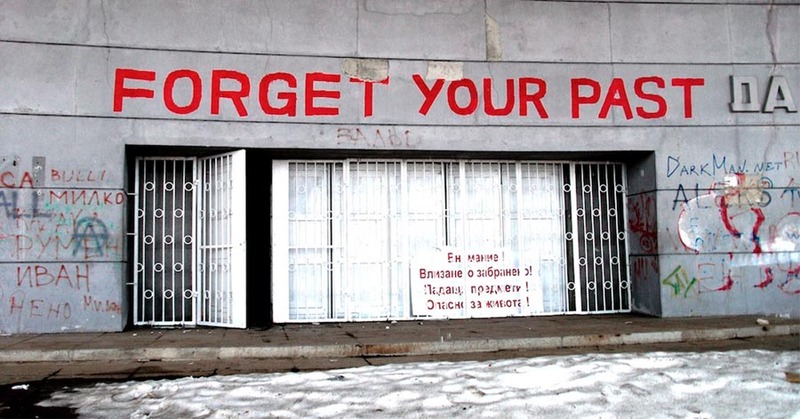 This iconic graffiti appears in many photos of the site, the sentiment serving to summarize the feelings of many Bulgarian people. Nowadays most young Bulgarians would simply rather forget their nation’s communist past, drawing a line beneath the mistakes made by another generation. Not every Bulgarian is so keen to see their history erased, however. 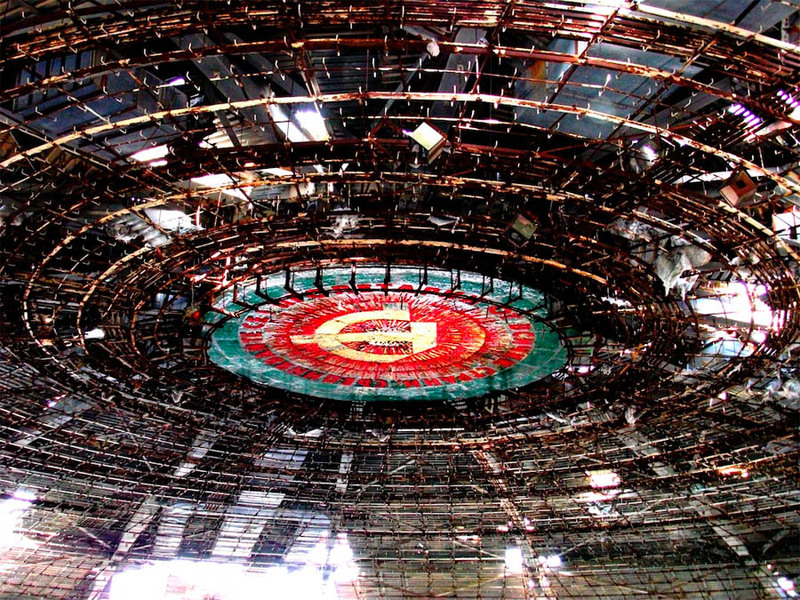 Even now, plans are being made to restore the House-Monument of the Bulgarian Communist Party to its former glory. On one of my numerous visits to the site, I got talking to a couple of developers who were surveying the building. 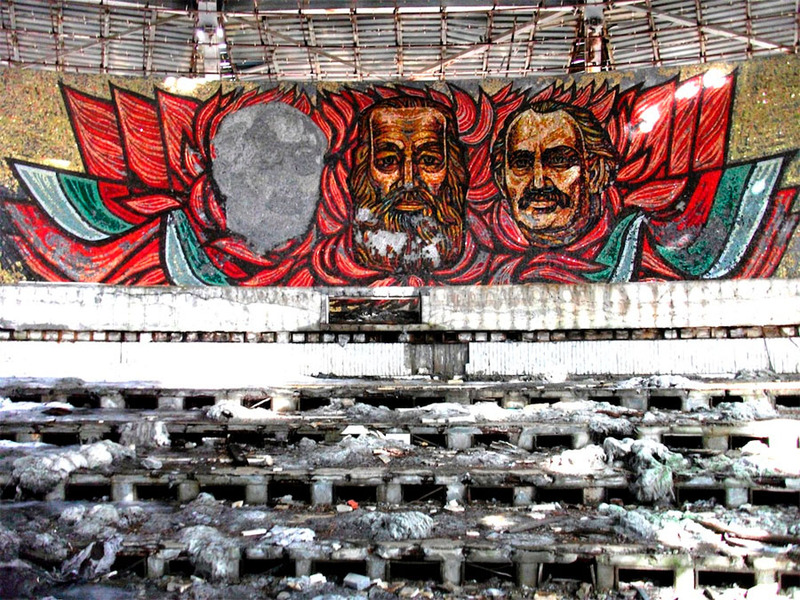 The striking red slogan was painted over in 2012, while deep inside the bowels of Buzludzha another graffiti tag has appeared by way of correction. “Don’t forget your past,” it recommends. Article by Darmon Richter for Dark Roasted Blend. Check out his site The Bohemian Blog with its catalogue of urban exploration reports here. Ah yes, the foolishness of man, thinking that he is able to save himself... In the process he has to murder his opponents, those who love life and their fellow man! This is interesting to me in light of a book I read years ago. It was the true story of a man who was arrested and tortured for his faith in Christ, in Communist Bulgaria. ..and we, a little bit west of Bulgaria, we are crying for our, I would say not communist, but socialist past. Before we were proud country, now we are just a joke, slaves of the capitalist, "developed" west, in fact, servants of new, more polite, evolved, fascist occupiers. Maybe they should turn it into a nightclub. Can you imagine the nightclub that building would make! It's really, really sad that all these buildings from the soviet era left to rot, it's not only interesting from the point of achitecture but it's a remarkable monument for what happend in the past. I agree with Hidden Mountain. Lenin Communism left Jesus behind along with a lots of blood of Bolsheviks. LENIN AND STALIN CAPITALISED ON THE WORKER. Now they are part of the past, THEY RAN OUT OF MONEY. Poor USA has a socialist clown in power and a lot of followers of Jesus in the land praying for mercy. It will be interesting to see what happens. P. S. Night club is a "good" idea just like socialism, the roof would collapse on the dancers. All that hard work to be left vulnerable, Who's fault is it? The USSR Government's fault. They bowed to Ronald Reagan because USSR ran out of money! Cypress and Greece are next. Learn how to spend money or you are SLAVE to lender. Simple as that! It would make a great Cometic Surgery Spa and Hotel for all the Eastern European crooks.